Global climate change has long been a difficult subject for journalists to cover, given its fusion of complex earth science concepts with heated partisan politics. There are numerous pitfalls one can fall into when reporting on climate change, two of which have recently risen to the fore. The first concerns a series of controversial articles by syndicated Washington Post columnist George Will, which bring up the issue of misleading reporting of climate science. The other issue, which will be tackled here next week, deals with how to portray the relationship between extreme weather events and global warming. During the past three months, George Will has written three columns on global climate change, each of which has been controversial. Will's February 15th column entitled "Dark Green Doomsayers" prompted a wave of criticism from climate scientists and science writers, not to mention everyday readers, and eventually caused the Washington Post's ombudsman to address the matter on March 1. The Post's ombudsman, Andrew Alexander, found some problems with the piece, but did not find evidence that Will committed factual errors or distorted facts in the February 15th article. However, avoiding those cardinal journalistic sins does not constitute the end of Will's responsibility to readers. There is another important consideration, which is whether he provides readers with misleading climate science information that conflicts with what scientists know about the climate system. This is more nuanced than blatantly stating falsehoods, but it is perhaps just as important. "Reducing carbon emissions supposedly will reverse warming, which is allegedly occurring even though, according to statistics published by the World Meteorological Organization, there has not been a warmer year on record than 1998." Will appears to have borrowed this nugget from climate change skeptic web sites, which have elevated the argument that global warming has stopped or reversed to the status of an Internet 'meme.' However, it has been debunked time and again. Will's statement (and another like it in a previous column) is correct in the sense that the World Meteorological Organization considers 1998 to be the warmest year since the start of the instrumental record (although NOAA data indicate 2005 was just as warm). But he fails to accurately convey a fundamental facet of the global warming story, which is that human influences on the climate system take place within the context of the planet's natural climate variability. As a forthcoming scientific study in the journal Geophysical Research Letters makes clear, man made global warming is not likely to take place in a monotonic manner, in which each year is warmer than the next. Instead, as can be seen throughout the observational climate record, there will be zigs and zags in the temperature graph. Sometimes the planet may halt its overall warming trend for as long as a decade or two, as may be occurring now, but at other times such a trend will accelerate. The important point is that over decades-long, statistically significant timescales, the climate is likely to continue to warm, with potentially profound consequences for the planet. The study, by David R. Easterling of the NOAA National Climatic Data Center and Michael F. Wehner of Lawrence Berkeley Laboratory, was written in response to those like Will who assert that periods without a clear warming trend proves that global warming is not occurring. "...it is reasonable to expect that the natural variability of the real climate system can and likely will produce multi-year periods of sustained "cooling" or at least periods with no real trend even in the presence of longterm anthropogenic forced [man made] warming," the study states. "Claims that global warming is not occurring that are derived from a cooling observed over such short time periods ignore this natural variability and are misleading." As Easterling and Wehner note, the record warm year of 1998 occurred during an unusually strong El Nino event, which exerted its own natural warming influence on the planet. In other years, natural variability may instead work to counteract some of the man made warming trend. "As global levels of sea ice declined last year, many experts said this was evidence of man-made global warming. Since September, however, the increase in sea ice has been the fastest change, either up or down, since 1979, when satellite record-keeping began. According to the University of Illinois' Arctic Climate Research Center, global sea ice levels now equal those of 1979." According to climate scientists, citing "global" sea ice statistics like that is nearly meaningless in the context of global climate change, since it is well known that Arctic sea ice (i.e., the North Pole) should diminish in a world warmed by greenhouse gas emissions, while the Antarctic sea ice would remain stable or even grow. Such patterns are predicted by the computer models scientists use to help predict climate shifts, and is verified by their understanding of climate dynamics. George Will's recent columns demonstrate a very troubling pattern of misrepresentation of climate science. They raise some interesting questions about journalism, specifically concerning the editing process. Editors and fact checkers are there to ensure that publications like the Washington Post don't print factually incorrect information. But how much oversight should there be of opinion pieces that address scientific subjects such as climate change, particularly when they are written by persons with little scientific training? Is there any additional role for editors to play in ensuring that scientific facts are not manipulated into making assertions that most scientists say are misleading, and essentially inaccurate? Or is it necessary to err on the side of allowing opinion writers flexibility in how they use facts to present their point of view, regardless of whether their argument may be viewed as flawed in the eyes of the mainstream scientific community? Hi Matt. Discourse is healthy, of course, and Will is free to express his arguments, provided they are factually accurate. However, he has consistently made arguments based on scientific data that scientists have repeatedly stated are not correct, based on their current knowledge. No science is an exact science (neither is meteorology), but he never acknowledges that scientists dispute his views as misleading, choosing instead to present the information as if it is fact, in order to support his ideological viewpoint. I fail to see how the issue of "tipping points" is relevant here, considering that Will did not raise that issue, nor did my column. That is a different facet of climate change than the more elementary issue of how human forcing interacts with natural variability. Will seems to be unaware of that basic part of the climate story. "he should be allowed to question accepted facts"
"healthy discourse"?? when does the discourse lead to healthy consensus. we did eventually stop arguing about whether the earth was flat - although climate change deniers may have still have something to say about that as well. Thanks, Andrew. My only quibble is with: "The Post's ombudsman, Andrew Alexander, found some problems with the piece, but did not find evidence that Will committed factual errors or distorted facts in the February 15th article." Alexander only reviewed one problem -- the misrepresentation of the University of Illinois. Will made a clear factual error there -- he claimed the U of I data said global sea levels were the same "now" (February 15, 2009) as they were in 1979, when in fact they were about 18% lower than February 1979. Furthermore, Will distorted numerous facts. The ombudsman did not that his inquiry found that Will did not make factual errors or distort facts. In fact, he strongly implied the opposite: "The editors who checked the Arctic Research Climate Center Web site believe it did not, on balance, run counter to Will's assertion that global sea ice levels 'now equal those of 1979.' I reviewed the same Web citation and reached a different conclusion." That is to say, Alexander concluded that the U of I web site runs counter to Will's assertion. That is to say, Will made either a factual error or distorted facts. Matt, I wrote in my piece that Will's assertion that 1998 was the warmest year on record (according to the WMO) is factually accurate. What is misleading (and inaccurate in many scientists' views) is his implication that this fact invalidates the evidence that greenhouse gas emissions are warming the globe over a longer time period. Most climate scientists say that it does no such thing. This is not a matter of needing to have one "official line" on climate change, as you seem to think I am arguing in favor of. I am just as afraid of scientific dogma as you are. Rather, I am in favor of basing discussions of climate science on the science itself, rather than on cherry picking data, which scientists have repeatedly repudiated. Attempts to portray Will as offering up inconvenient truths, to use Gore's phrase, are ill-conceived, because he seemingly cannot or will not distinguish between long-term climate trends and shorter term variability in the climate system. Such a distinction is simply climate change 101. There are many valid arguments that suggest a cautious view of the conclusion that we are entering a period of severe climate change. But Will falls short of offering any of those. My hunch, Brian, is that you could do a far better job of offering a valid argument for a more cautious view. You're welcome to do so here at CWG, as you know. Matt, can you show me where the NASA page you link to states that the record solar minimum shows that solar cycles have more of an influence on the earth's climate than previously thought, or that solar cycles outrank greenhouse gases in terms of climate forcing? To me, it doesn't seem to prove your point. Nevertheless, the solar minimum is interesting, and must be contributing to some extent to recent slight cooling relative to recent years. Sorry to interput but we are having a snow shower in NW Montgomery County. We live in a country where (almost) anything - "acceptable" and otherwise - is allowable. The issue is responsibility of a mainstream news organization, such as the Washington Post, in permitting publication of WILLfully misleading and/or inaccurate information, especially when on such an important subject as global warming. Will is intelligent enough - even if not a climate scientist - to know exactly what he's doing, whcih raises the question of motives and, perhaps, who he is shilling for. Given his "conservative credentials", it's reasonable to surmise that, at least part, this is paranoid concern of Big Government entering the arena of private enterprise as it relates to measures to deal with climate change. He, and most of the same ilk, want to stop just the consideration of climate change policy by undermining the scientific consensus that global warming is here and presents challenges to mitigate and/or accommodate the consequences. The role of editors in policing opinion writers is not clear to me, so in that respect I can't really answer your questions. As a discerning reader, I can say that George Will's opinion pieces on the environment and education have been a pitiful joke for quite some time. This is, after all, the opinion writer who passed along the urban myth about the Prius being more polluting than the Hummer, based on a very poor-quality study whose assumptions fall apart upon the most cursory of reviews. Stiil, if I were the WaPo ownership, I'd be concerned about the paper's reputation for quality. How long do you want to coast on someone's past reputation, really? Snow! Radar does show echoes and with our dew points so dry, that makes sense. We're too warm for any trouble though. Andrew, there have been numerous research papers published correlating deep solar minima with global climate changes (Dalton Minimum, Maunder Minimum). The linked NASA article discusses the recent failure to forecast the "bottom" of the current minimum (the longest in over 100 years). My point is that all is not known yet. So I don't mind that we argue the "facts" just a wee bit longer. We had a colder than normal winter and it's running into spring thanks to continued snow cover on the Great Plains. There are also reports of thinner-than normal Arctic sea ice despite our cold winter. Perhaps ocean currents are influencing this parameter by pumping more warm water towards higher latitudes. Mr. Freedman, didn't you write a column about the wildfires in Australia? Your column was one HUGE misrepresentation! You wanted your readers to think global warming was to blame, so you conveniently omitted all of the facts which proved that AGW was NOT the cause. In that column, you failed to mention that local authorities were blaming the fires on arson. In that column, you failed to mention that the drought they are experiencing is due to the IOD. And here you are criticizing another columnist for writing what you characterize as a misleading column. Dr. Tracton wrote, "The issue is responsibility of a mainstream news organization, such as the Washington Post, in permitting publication of WILLfully misleading and/or inaccurate information, especially when on such an important subject as global warming. " Where were you during the gross misrepresentation of facts when Andrew Freedman was the one doing the willful misleading?!?! You were arguing that AGW could be playing a role. You didn't say a single word about Mr. Freedman's omission of facts! Not one!!! Not a single criticism about Mr. Andrew Freedman's "misleading and/or inaccurate information"! oh my gosh! snow?! how much am i going to get in falls church? george will's statements may have been technically true (because cleverly cherry-picked etc...), but the fact that he was able to largely "get away with it" (that it resonates) is a reflection of the poor job the media and scientists have done in educating us. (we can argue about whether that's their job later.) george will was not trying to educate us. he was making a point - about policies, limited government and so on. the public's ignorance on global warming gave him an opportunity to make his government point. the truth about it is irrelevant to him, but it helps his limited government arguement. if he were trying to educate us about global warming, he'd have reminded people that "arctic" is north - where santa lives, for now - and "antarctic" is south. then he'd explain climatologists prevailing theory that the arctic will warm faster than the antarctic, and how, counterintuitively, the antarctic might recieve more snow, i.e., ice. then he might have shown the two graphs of arctic and antarctic ice show arctic ice sharply down and antarctic slight up. instead he blurs this and plays on ignorance by begining with polar bears (arctic), then comparing GLOBAL ice. it's accurate, clever and deceptive. my point is that public perception is shaped by RHETORIC, not facts necessarily - because the public is so ignorant, because the denialists' rhetoric is so much better than the realists'. something like 57% of the public "believes in" global warming whereas 97% of relevant scientists do. (maybe mr.q. can check my stats there.) that gap must be closed before society will "get on board" with any meaningful solutions. now, i am not suggesting realist rhetoricians adopt the denialist clever, deceptive techniques - just the clever ones... they shouldn't have to be deceptive. it should be so much easier with the "facts" on their side. anytime i EVEN THINK ABOUT littering, i think of that "crying indian" commercial from the 70s. man, that was good rhetoric. Thanks for taking on Will's misleading columns. It takes some guts to take on a columnist in your own paper (however justified), so kudos. I guess it takes some courage to criticize a columnist as famous as Will. However, your post contains a clearly false assertion. "The Post's ombudsman, Andrew Alexander, found some problems with the piece, but did not find evidence that Will committed factual errors or distorted facts in the February 15th article. However, avoiding those cardinal journalistic sins does not constitute the end of Will's responsibility to readers." you assert that Will's op ed "Dark Green Doomsayers" did not contain "factual errors". This is false. He claimed that total sea ice coverage was the same (using the present tense referring to the date of the column) was the same as in 1979. It was lower at the time. This is a plain factual error. In attempting to defend himself, Will said he was referring to the recent past, when, according to his source, global sea ice cover was 500,000 sq km less than in 1979. Later, he argued that his original claim was true because (at the cherry picked date) sea ice cover was reduced by less than 3%. His claim was that it was not reduced at all. That is that 500,000=0. This is a plain an error of fact as is possible. The Washington Post ombudsman does not have the power to make things true. Also, while he did not note the plain falsehood of Will's plainly false assertion on a simple matter of fact, he did retract his initial defence of Will and said he disagreed with the editors who agreed with Will that, well, that 500,000=0. The fact that he chose not to assert that Will made a totally false claim on a simple matter of fact, does not mean that he claimed that Will had not done so. In any case he is not an expert and the cited document is brief, clear and plainly proves that Will's claim of fact was false. Of course it was also cherry picked and misleading, but it was plain false. If you insist on arguing that Will did not make a false claim on a matter of fact, please explain how a claim on a matter of fact can be false if his wasn't ? i stand corrected...will was not merely clever and deceptive...he lied. that's a great display - that randomly-generated first 10 years of a 30 year upward trend. i wonder what the "recent cooling" graph would look like if you "took '98 out" of the data - i.e., if later years weren't influenced by its being a record year. i'd like to see a temp graph from say 1998 to 2008 with 1998 being made an average of '97 and '99. Mr_Q said: "And here you are criticizing another columnist for writing what you characterize as a misleading column." So you are saying that George Will's arguments are sound, factual, and not misleading? Also, I believe you milked your argument against the viewpoints put forth in the Australian wildfire article enough. We don't really need to go back to that again (one reason why the comment section to that article was closed). Anyway, I was especially intrigued about the bit concerning Arctic and Antarctic sea ice. Is there an inverse proportion with the extent of the ice in the two regions? I'm not trying to denounce anybody or anything and these are only comparative numbers, nothing to indicate a trend, just take from them what you will. You make a great point about 1998. I recently made a graph of temp trends and averaged the years 1997, 1998 and 1999 together and the trend was very slightly upward. As Andrew has stated, people really fail to realize the complexities of all the processes (anthro and natural) that affect our climate. The current solar minimum as well as the Pacific Decadal oscillation which is trending negative could counteract warming (as perhaps we are already seeing). By no means though does this mean CO2 emissions are not having a large contribution to overall warming. If there were no anthropogenic global warming, temps would likely fall off dramatically with the -PDO and solar minimum. I am still a bit confused myself about all the different natural variables. clarification: the graph I made that averaged 1997/1998/1999 together began with those years and stopped in 2008. a 10 year trend. also, was the day of the study a particularly "good" day to pick? in terms of it being anomalous? would a week or two (or other time of year) earlier or later made the case less "convincing" for the study? Brian, I am not sure what your aiming to show with your data. Can you elaborate a bit? Does your info contradict the NSIDC/NASA data released yesterday? http://www.nsidc.org/arcticseaicenews/2009/040609.html. well, that's exactly the graph was imagining. now, i wonder what, say, 88 to 2008, with 98 being "kept average", would look like? anyway, little trends don't mean much (unless they prove MY point...). climate people talk about 30 years being the shortest increment of any kind of trend, but even that seems arbitrary. It should be noted that in addition to the ombudsman's piece in response to Will's Feb. 15 column, the paper also ran two responses in the form of an op-ed by Chris Mooney, and a letter to the editor from the director of the World Meteorological Organization. Andrew, I'm not really aiming to say much, just clarify. I've heard many a person screaming that the Antarctic ice is expanding to support their arguments. We are slightly above average at current, at the height of the melt season we were in fact below climatology. An early onset to freeze-up has helped reverse the trend so far, and even so we are well below the expanse that we saw last year at this time. Thanks Brian for your clarification. I think with the Antarctic, people often confuse the melting of some land ice (Larsen B etc.) with sea ice, although as you point out, they're a bit down on sea ice right now as well. yup - that "scientists warned of ice age" meme, while false, plays on people's thinking scientists are incompetent - which is an important filter in the denialist prism. "wacky alarmist scientists can't decide which disaster is coming!" Enough already with the Australian Wildfires - we discussed this at length the week that Mr. Freedman wrote the column. I am unsure whether your highly selective memory will recall being corrected by a number of different people who were keen to point out to you that Mr Freedman reported straight from Australian media outlets rather than creating an opinion piece. These Australian media reports carried statements from the country's leading scientists at the Commonwealth scientific research organisation (CSIRO). The CSIRO scientist reported that the February bushfires were indicative of the type of event Australians could experience in the future. This was based on research that indicates the impact of climate change in Australia will result in higher mean temperatures and longer dry periods - perfect conditions for fires in our eucalyptus forests that are reliant on fire to rejuvenate. The CSIRO scientists didn't assert that bushfires are new there or that we haven't had deadly fires before, they were simply highlighting the intensity of these could become more common. Mr Freedman's column in turn reported their findings. It's insulting that you would compare Mr. Freedman's report to the columns of Mr. Will. Mr. Will has been caught out again abusing his pulpit to misrepresent data and delivering his opinions as a statement of fact. It's actually disgusting the way Mr. Will (and other pundit-agents of industry's brainwashing/obfuscation army) is capitalizing on the general weak mathematical/statistical literacy in the general population to sow seeds of doubt about a clear scientifically-measured trend. Despite the fact that Will's education is in history and philosophy, I highly suspect he is fully aware of the ruse he is pulling on the poor intellectually unarmed FauxNews-type news consumers. Shame on him. It's late June in DC, and cosmologists who understand the basics of the earth's tilt and revolution around the sun warn us that we are headed into a very hot period (aka July/August summer in DC). But wait! For the past five days, it has actually cooled by half a degree each day, from 78 to 75. This means those astronomers who keep trying to convince us that the dog days of summer are coming, were just pulling our legs. Obviously they are trying to flatter the people who hand out the grants for studying summer. No need to service the A/C after all. ha! "half a degree each day" - that's a trend! “As the 2008-2009 arctic ice season comes to an end, the North American Ice Service has determined the maximum sea ice extent date to have occurred on 08 March 2009. The total extent was calculated to be 14.84 million square kilometers. This figure and date of maximum extent are based on actual analyses of multiple sources of satellite imagery with spatial resolutions of 1km or better and may differ from other observations. A trend of lower winter Arctic sea ice extent maxima continues with the 08 March 8, 2009 maximum extent, which is the fifth lowest on record since satellites began routinely imaging the northernmost latitudes. The National Science Foundation’s Study of Environmental Arctic Change (SEARCH) program in coordination with the North American Ice Service, National Snow and Ice Data Center, NASA , and others will deliver an integrated, community- wide outlook for the upcoming summer ice minimum”. Brian, thanks for providing that information. Has your group reported any ice age and thickness information as well? Thanks! Why would believe anything that George Will, a right-wing propagandist, writes in the first place? What a shock that Andrew would be upset with George Will's "troubling pattern of misrepresentation" when he addresses climate change. My goodness, many folks are equally upset with Al Gore or James Hansen or many others, including subliminal suggestion from the mainstream media on the opposite side of misrepresentation. If you wish to be blasted with a barage of misrepresentation or convenient skewing of the facts, that is so simple to achieve. Tune in and pay close attention to many so called experts or most well known commentators on either side of this issue. Which side do you wish to be mislead by???? In my opinion, Matt Rogers of CWG expressed the highest level of unbiased common sense today. It is somewhat amusing to observe others waste their time and energy expressing suppressed outrage with George Will for engaging in commonly displayed behavior. For anyone who believes climate change conclusions or forcings to be a closed case within the scientific community,you have been listening to the wrong people. Noaa scientists released a 136 page report on this issue a few months ago. Among the highlights of this report, NOAA now states that "More than half of the North American warming since 1951 is LIKELY the result of anthropogenic greenhouse gas forcing of climate change". Now, what are the scientists at NOAA in consensus with?? Are they saying that there is a 60% probability that 51% of observed warming over North America during the past half century is anthropogenic? My goodness, great certainty!! If they had a 90% level of certainty, they would have indicated "very likely". NOAA scientists now also say that "No significant surface temperature changes have occurred during the past 56 years over the southern U.S. or eastern Canada". It must have been your imagination. For a summary of this report and a link to the actual report. Should we attempt to mitigate or adapt to climate change?? This report also contains interesting insight to this question. For authentic info on climate change, check realclimate.org - a blog written by climate scientists (many) who realize that informed members of the public are readers, in addition to other scientists. It's an excellent source of factual info, plus a look into how scientists think. I haven't read the first two George Will pieces but did read the most recent one Andrew linked to. I wouldn't say it crosses any line for an opinion column. Aside from the line about 1998, most of the column was about CFL bulbs, much of which I agree with. Upthread I claim that the first Will op-ed contained a plainly false claim. I addressed my comment to our host Andrew Freedman and was quite sharp in tone. Sorry for the tone. For a young blogger to take on Will is admirable. The line between false and misleading is inevitably subjective. spgass1: Will's most recent column contained the misleading line about 1998, which was the third time in as many months that he has published a column with that and other misleading climate science info. That's what needed to be called out, even though the column on CFLs may overall have crossed no journalistic red line. Rjw88: No worries, I did not take any offense to the tone of your comments regarding factual errors. Thanks for the apology, however. On his Prometheus blog, Roger Pielke Jr. of the University of Colorado at Boulder has an interesting (and skeptical) take on the study by Easterling and Wehner, from which I had quoted in the above story. will's light bulb column was like complaining about the model-t ford. fancy light bulbs and nearly all "green" technology is still in its infancy (because denialists have retarded its growth). Whether his ignorance is intentional or not is left as an exercise for the reader. Having a spirited discussion about climate change is one thing but Will has proved time and time again that whenever the facts don't suit his beliefs it's perfectly acceptable to fabricate the information to misinform readers. Well, the Post should pay attention because intelligent readers aren't having it, especially me. When dinosaurs like Will persist in a willful misinformation campaign your readers will simply abandon The Post as a reliable source of thought provoking opinion and of news. pielke and this other guy, watts, have got to be exposed! when the mainstream media reports on them, they should say, "using false data, so-and-so claims..." like they would had he claimed the earth was flat. 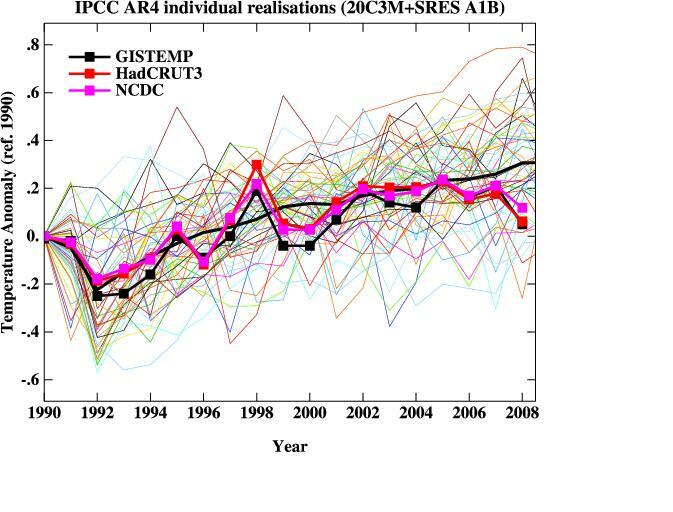 using "old" data when corrected data is available, arctic/antarctic bait-and-switch, lying about sea-level rise. if people truly understood what was going on, they would understand on an intuitive emotional level that denialists are hiding something. If CO2 is the driver and it continues to increase, how can it not drive for a decade, or even two? Junk Science indeed and very convenient. How can there be any measurable human influence when natural climate variability is so strong? harbinger1, do you think we need to study global warming a little bit more, until we're 100% sure it's co2 - base our decisions on sound science - before taking rash measures which may not be necessary anyway? "junk" and "sound science" are denialist-created words that mean exactly the OPPOSITE of what it sounds like. We know that melting sea ice does not contribute to rising sea levels; but, it does decrease salinity because the sea ice is "fresh", i.e., salt left behind upon freezing - which has long since dispersed. Andrew, Matt or anyone: Question: is anything known whether or how the decreased salinity might effect ocean currents and thereby result in "unexpected" consequences?? This process is invoked to explain how the Gulf stream could be shut down, but how about elsewhere either over the Arctic Ocean or around Antarctica ?? Hi Steve, I believe a lot of the global warming Absolutists would disagree with your statement that ice melting does not contribute to sea level rise. Although, the mysteriously not-yet affected Maldives are happy to hear it! The idea of fresh water infusion upsetting the gulf stream conveyor belt is interesting and still subject of unsettled debate, if I recall correctly. At what point do we start to call people like Will a liar.
" ... Dr. James Hansen of NASA GISS gave his 20 year anniversary speech before congress, in which he was restating the urgency of the global warming crisis we now face. Warnings of tipping points, and a call for putting “energy executives on trial for crimes against humanity and nature” were parts of that speech. Here are the just published global temperature data sets ... "
Full article with 30 year temperature graphs is here. This June will mark the 21 year anniversary of Dr. Hansen's testimony before Congress. Please point to the scary catastrophic man made global warming on this graph. How many years must pass before you alarmists wake up to the fact that Dr. Hansen's and the IPCC's hypothesis is obviously wrong? Sensationalism is a manner of being extremely controversial, loud, or attention grabbing. It is especially applied to the emphasis of the unusual or atypical. It is also a form of theatre. In the extreme case, the media would report the news if it makes a good story, without much regard for the factual accuracy or social relevance. Thus, a press release including ridiculous and false pseudoscientific claims issued by a controversial group is guaranteed a lot of media coverage. And what happens when ordinary people make the mistake of thinking that what they read/see/hear in the press/media is the whole truth and nothing but the truth? You end up with hyperreality, which leads to poor souls doing dumb stuff like this. you may not be a climatologist, but perhaps you can answer my question: i heard it's really cold somewhere today - does that mean global warming is over? or maybe was never happening? No, it's actually very basic science and math. "Noise" can, and almost always will, obscure a trend for some periods of time. In this case, weather is the noise, and it obscures a climate trend. You can prove the same thing without using any climate or weather data at all. See here for an example. My previous was a response to Harbinger1, who said, "Now that's a licence to print money! Whatever happens, it's always global warming, keep the funding coming in......"
The reference disappeared somehow during the posting. Matt - I don't know of any global warming "absolutists" (whatever that means) who claim that melting sea ice causes an increase in sea level. The distinction between sea ice, which floats on top of the ocean and does not raise sea level when it melts, and ice sheets on land which do raise sea level when they melt, is well known, although the popular press may confuse their effects on sea level from time to time. Mr. Andrew Freedman today, April 8, 2009 - "I don't know of any global warming "absolutists" (whatever that means) who claim that melting sea ice causes an increase in sea level. The distinction between sea ice, which floats on top of the ocean and does not raise sea level when it melts, and ice sheets on land which do raise sea level when they melt, is well known, although the popular press may confuse their effects on sea level from time to time." Mr. Andrew Freedman on April 28, 2008 (less than one year ago) - "The important thing to remember, however, is that it makes no difference to the atmosphere whether emissions come from countries with high per capita emissions rates or low ones, or whether diplomats hurl silly names at one another. The warming effect will still be the same, and the Maldives will still be swimming." "According to NSIDC, over the last 30 years Antarctic sea ice extent has been growing at a rate of nearly 5% per decade, and set a record maximum last year." He said evidence from past climates confirmed that Greenland should be able to survive temperature rises higher than 3C. An ice sheet about half the size is known to have persisted there during the Eemian period, about 125,000 years ago, when temperatures were about 5C higher than today." Did everyone catch the last sentence? Approximately 125,000 years ago, the temperatures were about 5C higher than today. Keeping that in mind, please point to the catastrophic man made global warming on this chart. 1998 was an outlier year. In fact it was the year that finally made me a believer in global warming. wattsupwiththat.com was is not a "wingnut" site. It was the 2008 Best Science Blog weblog award winner. And if you had bothered to read the article (some find that useful *PRIOR* to commenting), you would have found that he links directly to his source at NSIDC. Check it out for yourself. The graph is here. Look at the bottom sentence on the graph - 4.7% per decade. So a year that you called an outlier convinced you that AGW was real? Do you know the definition of outlier? Uh, whut's this then? The Washington Post, echoing right-wing talking points, and getting stuff factually wrong? Andrew, you seem an earnest young lad. Authentic, even. Find yourself a job at a more reputable establishment. The Post is stacked with Reaganite dinosaurs like Will, whose willful distortions are applied liberally to print to accommodate the entire editorial board's, er, conservative views. Fact-based critique of Post reporting is like shouting at a man who's killing a tick on his forehead with a pistol. Best to just let him shoot and put us all out of our misery. Once again, critics are pointing fingers at someone having a different opinion from theirs. It was very telling that in the last discusion on Climate Change only Bob Ryan was was willing to venture a guess at how much is actually man made. I believe his estimate was 3%. So if 97% is part of a natural cycle, do we really want to send rockets to pollute the upper atmoshere as some in the administration are now considering? Their theory is to attempt to block some of the sunlight. Is this insane or what? Scientists need to find out what is causing the 97% of the current warming cycle before we do something really stupid. I can't wait to see the US go to the UN and try to sell this idea to the World's most useless organization!!! mr.q asked, "will the real slim shady please stand up"
i just don't get it. is there a contradiction in andrew's statements? you must be seriously confused. bob ryan did not say anything like "3% of global warming is man-made." Yes Bob Ryan did say his guess is about 3% of global warming is man made. It was in response to my question!!! The contradiction lies between Mr. Freedman's many previous posts and his reply to Mr. Rogers. The contradiction isn't in the actual facts. The contradiction is in the impression Mr. Freedman provides the average reader, via his many columns, and in his reply to Mr. Rogers. Mr. Freedman has written many, many times about the melting Arctic ice. Mr. Freedman has written about rising sea levels. Mr. Freedman has written of the swimming Maldives. But Mr. Freedman, to my knowledge, has never written that melting Arctic sea ice will increase sea levels. No, he is much too clever for that. Mr. Freedman simply writes about all of the individual, separate events and lets the reader jump to the wrong conclusion on their own. The average reader, with only a superficial level of knowledge, would be forgiven for thinking that the melting Arctic ice was, or could be, related to rising sea levels. Ask yourself this - How many readers of Mr. Freedman's columns are aware that melting Arctic ice will have virtually no impact on sea level? 4%? 5%? Maybe 6% on the outside? But here we have Mr. Freedman openly admitting that melting Arctic ice will have virtually no effect on sea levels. Be still my beating heart! Better bookmark this one. You aren't likely to see Mr. Freedman admit that again. I don't believe he meant to admit it this time. It just slipped out while he was busy nit picking Mr. Roger's comment. You can rest assured it won't appear in any of his "The Arctic is Melting! The Arctic is Melting!" columns. So, will the real slim shady please stand up. And do I need to point out the irony that this occurred in a column where Mr. Freedman was complaining that George Will's column was "misleading"? Oh, the sweet, sweet irony. andrew's "admitting" sea ice melting is not raising sea levels hardly reason to bestill your heart. the reason andrew mentions sea level rise when discussing global warming is that sea level will, and has, risen. that's another uncomfortable fact that "skeptics" have to "explain away", and perhaps explains your sensitivity to andrew's sea level comments. whereas andrew's remarks are misleading to you, in the sense that you misinterpret them, george will's column was ACTUALLY misleading, in the sense that it was false. "george will's column was ACTUALLY misleading, in the sense that it was false." Not true. Even Mr. Freedman admits his column did not contain a factual error. Ryan was actually (correctly) disagreeing with BV/Louisa's bogus claim. Notice the use of the symbol "?". For those who may not be aware, in English this is frequently used to denote a question (italics added). I thought we were discussing climate/global change science not "paranoia". First, it has been brought up . . . by you that is. As you know, Segalstad's speculations are in a 1998 book with no peer review. I will ask Arthur Conant Doyle to research this. In the meantime some data for CO2 emissions. "I have yet to see a reliable scientific study that shows what percent of this current warming period is due to the natural cycle and what can be verified as caused by humans. Humans where not around for any of the previous warming periods. It makes a huge difference if the human contribution is .1%, 1% or more than 10%. This needs to be defined so we know how to spend the huge sums of money proposed! see the evasiveness and deception? it's very clever i must admit. you asked, roughly, "how much WARMING is caused by man?" but he answered "how much CO2 is produced by man?" it's entirely different. the bonus part for brian is that you remembered it as bob having said it, and you remembered it as having had your question answered. bob - having been misdirected by brian's mis-answer - provided a link showing that nearly ALL of the carbon increase (from the mid 1800s levels) is due to burning fossil fuels. so, nobody actually answered your question of "how much WARMING is man-made?" you know, i initially thought will's sea-ice claim was "only" misleading, but as rjw88 points out above, it was false. That's precisely why "debates" with propaganda-mongers are of no use in determining the truth. As we've seen, memory can play strange tricks, but the Climate Capitalist is quite sure that his role on the 1963 championship Walter Johnson H.S. debate team involved demonstrating equal skill in representing both sides of the question. I really hate having to do this. There is simply no reason to reply to you. You won't track down facts on your own. And when facts are presented to you, served up on a platter, you somehow claim they state something other than what they state. So why bother? Just in case any else out there has been fooled by rjw88, here are the facts, with links, so that you can verify them yourself. In the column in question, George Will wrote, "According to the University of Illinois' Arctic Climate Research Center, global sea ice levels now equal those of 1979." I don't know anything about any subsequent comments about this by George Will, nor do I care. And I don't know the source of his data that supports that claim. But I do know that DailyTech made the same claim back in January, and it was a widely discussed article. George Will may have been tipped off by the DailyTech article. That article can be found here. DailyTech wrote, "Thanks to a rapid rebound in recent months, global sea ice levels now equal those seen 29 years ago, when the year 1979 also drew to a close." Please pay very careful attention to the word GLOBAL. They were speaking of GLOBAL SEA ICE LEVELS. And if you go read for yourself what George Will wrote, you will note that he too was speaking of GLOBAL sea ice levels. That is why even the Washington Post ombudsman had to concede that George Will did not make a factual error. Apparently, a great many people thought that DailyTech was mistaken, because those people were looking at data solely for the northern hemisphere. And just in case you think that I am wrong; Even the University of Illinois's Arctic Climate Research Center admitted that it was indeed true. Read it for yourself right here at THEIR web site. Don't expect any further replies. Replying to you is a complete waste of time. You won't read it. And if you were truly interested in finding out the truth, you would have done your own research. But you aren't interested in the truth. It is all about arguing and ideology for you. I've got better things to do with my time. if george will is getting his info from dailytech, then not checking it, well...i'd say that kind of undermines his credibility. did you even read what you linked to? did you understand it? "However, observed N. Hemisphere sea ice area is almost one million sq. 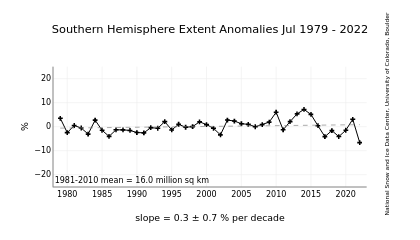 km below values seen in late 1979 and S. Hemisphere sea ice area is about 0.5 million sq. km above that seen in late 1979, PARTLY offsetting the N. Hemisphere reduction." just like rjw88 said. it appears you're the one who's been fooled. sheesh. "By altering the heat budget of the atmosphere in the Far North, sea ice loss will influence weather patterns and ocean currents. Through ripple effects in the air and sea, an increasingly sea ice-free Arctic in the summer may affect the weather in the Mid-Atlantic. The increasing flow of freshwater from the Arctic into the North Atlantic is already altering ocean currents, for example. Precisely how these changes would manifest themselves is a key question for scientists to explore as they grapple with the rapidly unfolding events in the Arctic. In addition to shifting weather patterns, the decline of summer sea ice could alter the course of global climate change itself, which in turn would have its own effects on the Mid-Atlantic region. One study published in June, for example, showed that rapidly melting sea ice could instigate or hasten the thawing of permafrost in far inland Arctic locations. This would release more greenhouse gases into the atmosphere, especially methane, and speed up warming around the world." "Mike, your analysis of the sea level rise issue is incomplete. You need to distinguish between sea ice, such as what covers the Arctic, and glacial ice. Glacial ice melt, such as melt from the ice covering the land surface of Antarctica, would increase sea levels, whereas sea ice melting would not." You can see that there might be a downward trend, and any idiot (well, apparently not any idiot) can see that connecting two data points and drawing a conclusion about the trend, or what we might expect the future to bring, is … you get the idea. I wrote in my comment, "And I don't know the source of his data that supports that claim." And neither do you. Nor do you know if he checked his source. You like to pile falsehood and bad assumption on top of falsehood and bad assumption, don't you? The DailyTech article was written on January 1, 2009. Obviously, if you take the time to read the article and LOOK at the red line on the bottom of their graph, they are referring to December 2008 global sea ice. And they wrote, "However, the mean ice anomaly -- defined as the seasonally-adjusted difference between the current value and the average from 1979-2000, varies much more slowly. That anomaly now stands at JUST UNDER ZERO, a value identical to one recorded at the end of 1979, the year satellite record-keeping began." To which, the University of Illinois's Arctic Climate Research Center replied, "Observed global sea ice area, defined here as a sum of N. Hemisphere and S. Hemisphere sea ice areas, is near or slightly lower than those observed in late 1979, as noted in the Daily Tech article." After admitting that, they then wrote the sentences that you quote. But what you failed to notice was that they didn't provide the end date that they were comparing to, did they? Ask yourself this - how can both sentences be true? The sentences follow each other. How can they both be true? The sentence I quote is not ambiguous. It states clearly, "is near or slightly lower than those observed in late 1979, as noted in the Daily Tech article." When you figure out how those two sentences can both be true, hang on to your hat and enjoy the ride. Sorry, I left off one of the links I referenced. It's a graph of antarctic and arctic sea ice extents. It's a little more than 1/2 way down the page. 1) If you want to have any understanding of a problem like global warming/sea ice extents you need to look at as much available data as possible. Searching around for isolated pieces of information to support your preconceived point of view isn't intellectually honest. 2) With an issue as complex as global warming, if you're basically a layman like me, you're probably better off believing the "experts", particularly when all the major international science organizations back them up, and their claims make sense(carbon dioxide IS A GREENHOUSE GAS - PERIOD! !, man is producing a lot of carbon dioxide, etc etc) and can at least in small part be verified (ex species moving into you area that only occurred far to the south of where you live until recently, etc). Also, I've caught the wingnut global warming deniers in so many lies I'm probably going to stop checking out out new "facts" supporting their wingnut points of view. They're always wrong. Thank you walter-in-fallschurch and david_r_fry for reminding me why posting here always makes me feel like I am on the Internet version of candid camera. And for reminding me why posting here is a complete waste of time. I needed reminding. that (http://nsidc.org/seaice/characteristics/difference.html) link was great! we should have had that at the beginning of the conversation. clearly shows the incredibly depressing big picture trends. that "tamino" link (inaccuracy) given by capitalclimate was great too. he's such a funny statistician (not a quality usually associated w/statisticians). Thanks Walter. I had an internet cafe in Albany NY for a number of years and use to get quite a few students coming in from the University at Albany's graduate program in Atmospheric Sciences before the start of each semester. One of them overheard me arguing with a Mr. Q type one day, and when Mr. Q had left he came over to me and told me I was probably wasting my time trying to discuss the issue rationally with somebody like Mr. Q, and that I might actually be putting myself in some danger, since, as the scientists at the University had discovered through hard won experience, people like that tend to be mentally unstable and unpredictable. The University even had to file orders of protection against some of those people since they'd come on campus and harass the Atmospheric Sciences faculty, staff, and students. He said they were worse than the Creationists and Anti-abortion crowd. My guess is it's probably some sort of psychosis. interesting/sad story. i still harbor hope that "skeptics" can see the light. i think there are two general kinds: the "knowledgeable" ones (like mr.q, who i find hilarious) and the apathetic ones who aren't really paying close attention but hear enough "chatter" to assume there's a controversy. these apathetic ones are just uninformed/confused, and i think can be "saved" (and we need more "believers" if society is going to address this). the first kind, the "knowledgeable" ones, are fodder for psychology class. i can't speak to abortion, because in that case i really can see "both sides"... as far as the (young earth) creationists, it is telling how global warming skeptics' tactics are EXACTLY the same as young earth creationists': cherry-picking, quote-mining, disdain for smarty-pants scientists/academics, etc.... marc morano is the new duane gish. they live in an alternate reality where they can interpret almost any evidence to mean exactly the opposite of what it means. weird, but interesting psychologically. If a person didn't know any better, they could get the mistaken impression that there are two sets of rules. One set of rules for comments which CWG agrees with or likes. And one set of rules for comments which CWG does not agree with or dislikes. Observe the comment by david_r_fry where he calls Anthony Watt[s] a name. Imagine if I had made the exact same comment, but instead of where david_r_fry wrote Anthony Watt[s], I were to write Andrew Freedman or James Hansen. Can I have a show of hands of the people who think my comment would still be published. I think we all know the answer. It would have been unpublished first thing this morning, if not sooner. And I would have been admonished for name calling, at bare minimum. "When you figure out how those two sentences can both be true, hang on to your hat and enjoy the ride"? i think they can easily both be true. they both support the idea that there is less sea ice now than in 1979. am i missing something? does "slim shady" count as name-calling? Do I detect signs of paranoia and persecution coming from you-know-who? That's a very bad sign. Maybe that has something to do with his confused thought processes. That's pretty discouraging. although I guess I shouldn't be surprised. Among my relatives and people i socialize with around Albany global warming didn't really come up as a regular topic of conversation until maybe the last 10 years. Nobody I know well thought it was a hoax, but early on a lot of them thought it was "chicken little" alarmism. One friend of mine used to call it a "delusional byproduct of beansprout poisoning", which was an understandable point of view if you knew some of the people we knew who were the most vocal about it. Virtually all of the people I know who thought like that have come around though, so there's hope. One thing that helped is that all those people despise people like George Will, Rush Limbaugh, Sean Hannity, etc, so when they heard those guys towing the wingnut party line on global warming they gave the global warming point of view a second look. ah...well...maybe that's the problem. my in-laws worship at the altar of limbaugh, huckabee, et al. in fact, during the election it took me a long long while to convince them obama was not a "closet muslim" seeking to islamicize america...what can i say? they live in an alternate reality (but they share the earth with us). This is probably going to be the last of my posts here. As I'm sure you're aware today the POST published an editorial reiterating the fact that Arctic Sea Ice is indeed melting. I guess I'm satisfied with that as amends for not jumping on George Will's lies sooner. Now if only Will would get on board. I'm sure he's a lot smarter than me, and if he went and looked at the evidence with any sort of objectivity he'd come to the same conclusion that we have. But does he have enough character to do that, then go public with what he found? I doubt it. George Will was right about the GLOBAL sea ice, and the news just keeps getting better! Since 2007, the global sea ice area anomaly has increased by more than 3,000,000 km2 and is now more than 600,000 km2 above the 1979-2000 mean. You could fit England, Spain, France and Mexico inside the recovered ice area. "It is great to see a WaPo writer with the stones to call a liar a liar when it comes to George Will's absurd nonsense on climate change. It's amazing the WaPo keeps this phony on staff. Says a lot about the editorial staff. Kudos to Andrew Freeman for standing up for ACTUAL facts...."
If you so much as lift a FINGER in retaliation toward your employee here in the weather department for embarrassing your high-priced "celebrity columnist" by speaking truth to his lies, know that YOU WILL SORELY REGRET IT. Contrary to what your failing management of this newspaper regularly assumes, you happen to be serving one of the most highly-educated and well-informed media markets in the country. Most of this town is now beyond *sick to death* of the alternative-reality-dwelling neoconservative tilt of your rag (it saddens me to refer to it that way, as I have lived here for two decades and used to respect the Post). If anyone at your paper suffers IN ANY WAY for speaking up against the propagandist stances of the new Washington Pravda, you will see a media consumer uprising in this city that verily will make your hair stand on end. Consider yourself warned, and consider shaping up. You may not realize it, but your paper is on its LAST LEGS not only financially but also fiducially and reputationally in this city. Just to clarify what I am warning the Post of in that previous comment: If there is retaliation against any of your employees for calling out the Post's editorial writers when one of them deliberately misleads your readership on fundamental and pervasively influential issues of public health, the boycott of your newspaper will be swift, severe, and thorough. You will soon find yourself holding the remains of an empty paper bag with font printed on it reminiscent of a recently-defunct longtime newspaper of record. Just remember: you may currently be blessed with stewardship of a revered and cherished masthead at the top of your pages. But you are NOTHING without the trust of the residents of this town. That trust has been eroded severely during the past few years, in great part due to your covering for the many lies that were told running up to and into the most recent war in Iraq. The editorial invitations during the past couple years involving various scientific issues has only driven another stake into the heart of your relationship with your educated readership. Spirited disagreement and free discourse is one thing. But deliberately working to spread scientifically discredited notions is quite another. I advise you to think well on your editorial policy concerning scientific matters from here on out. Will appears to have borrowed this nugget from climate change skeptic web sites, which have elevated the argument that global warming has stopped or reversed to the status of an Internet 'meme.' However, it has been debunked time and again." Precisely what was "debunked"? Are you saying that the fact that 1998 was the warmest year on record was supposedly debunked? I think not. Since you can't possibly be saying that, are you trying to say that something you magically inferred from what George Will wrote has been debunked? Is that what you are saying? Are you really and truly saying that George Will misled people and your evidence is something that George Will did NOT say was not true? You can't possibly be serious. Are you? the myth persists. perhaps that could be the topic of a future post, which might have to include a bit of a statistics lesson and something about discerning long-term trends from data. just a suggestion. thanks for all your good work.